Watch out for these Dining Room Trends for 2018! There are so many flashy new dining room trends coming out for 2018, and we’ve got them all rounded up in one sizzling hot list! The New Year is just around the corner, which means interior designers are buzzing around to see what the hottest new decorating trends will be. The dining room is one of the most important spaces in our home, and we love to keep it looking formal, flashy, and impressive for family and guests. We also want to avoid it looking a little démodé, and keep it on track with the latest decorating trends. Take a look at some of our favorite dining room trends of 2018 that we seriously cannot get enough of! 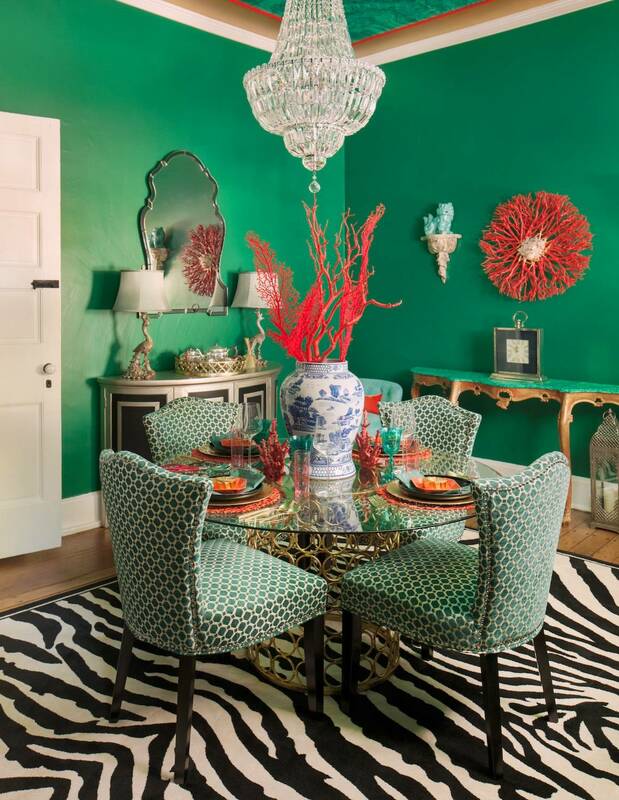 To really make a splash for 2018 in your dining room, change up your color palette to something more of-the-moment. 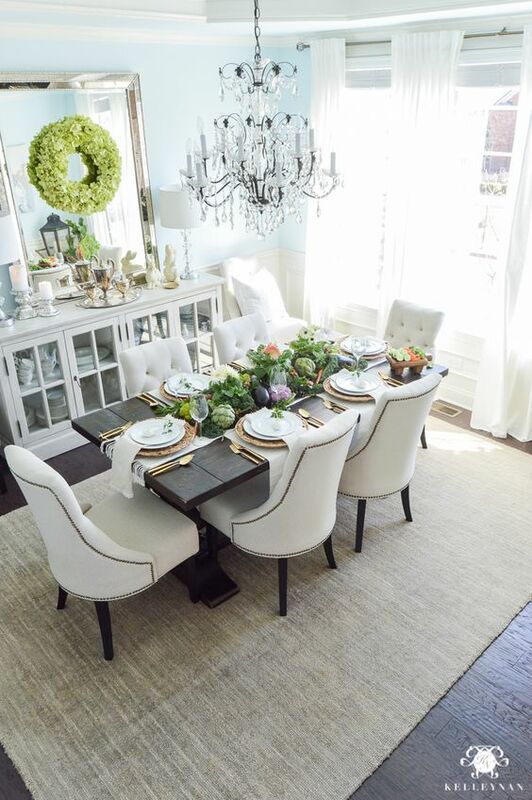 We are definitely seeing a lot of blue, moss, sage green as well as neutral tones popping up in the dining room. To bring your space to life with the hottest hues in decorating for 2018, you don’t have to slather your walls with one of these colors. Stick to neutral on the walls such as off-white and then play up your room with accessories such as sage green place mats and a huge bowl of moss as a centerpiece. Get creative when it comes to serving your dining table and try using things you already have around the house. All natural centrepieces made from pine cones, moss and rocks, as well as branches are even more beautiful than something store-bought. Fresh floral wreaths hung on the wall, and a great centrepiece paired with amazing cutlery such as Laguiole Cheese Knives and gold forks/knives make a fantastic statement. 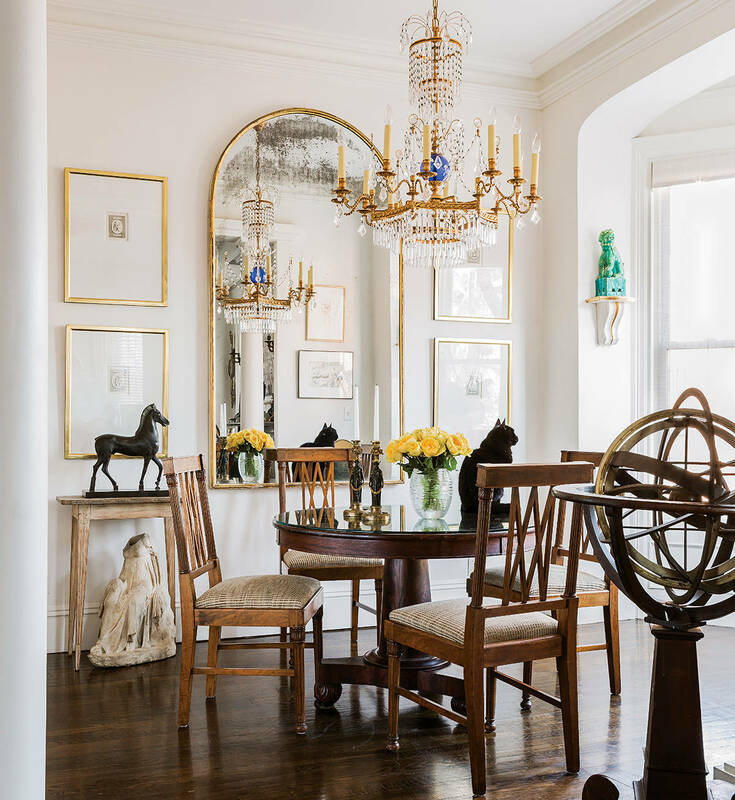 Even though I am a HUGE fan of gorgeous showy chandeliers in the dining room, 2018 is all about pendant lighting. Not only reserved for above your kitchen island, pendant lights can also be hung right above your dining table. They add warmth and focus on what’s important – a scrumptious meal, your table décor, or your centerpiece you passionately put together. Make sure to choose pendant lights that complement your hardware used in your kitchen. If you have brass cabinet knobs, drawer pulls and faucets, then choose a brass pendant light as well. When it comes to making your dining room really stand out for next year, try focusing on smaller details. 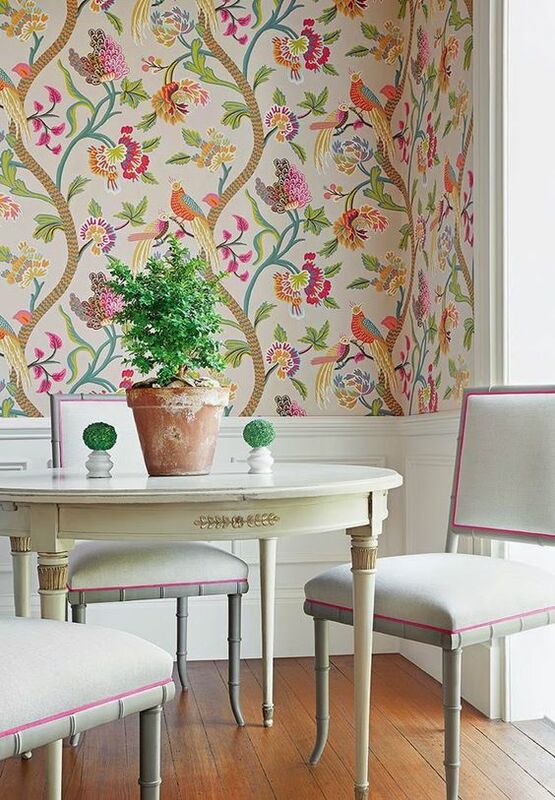 Hand painted wallpaper is a great way to revive your dining room, and always adds a classy, sophisticated look plus a wonderful conversation starter! How about rolling in a beautiful vintage bar cart into your dining room? Not only does it add extra space for food, but it’s also super convenient and looks uber chic. 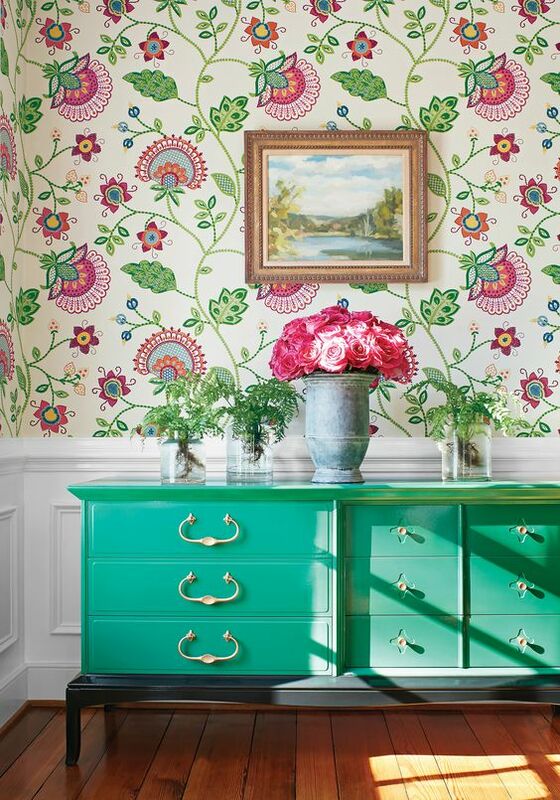 Make a bright statement in your dining room for next year with a statement buffet table. There are so many vintage buffet tables that you can find at flea markets and on craigslist which makes this pretty project quite affordable. A fresh lick of paint as well as new hardware can take an old buffet table from trash to treasure! Buffet tables are great for extra storage space for formal forks, knives, and plates as well as extra space for serving food. previous post	Review on CanvasDiscount.com – Custom Canvas Printing, Photo Blankets, Personalized Gifts, and more!